In per capita terms, Slovenia is the richest CEE country. In 2007, its highly successful economic transformation made Slovenia the first CEE country to adopt the euro. The Slovenian pension system is very similar to its Western European counterparts, which is an exception in CEE. Slovenia runs a three-tier pension system with a first pillar mandatory PAYG scheme. The second pillar consists of occupational pensions that are mandatory for certain sectors and voluntary for others. Voluntary personal savings constitute the third pillar. The pension system was reformed considerably in 2000. The public pension system was modified with parametric reforms that were to be phased in over time. Before the reforms, Slovenia had originally planned a mandatory second pillar, but chose voluntary supplementary schemes instead, an option the social partners were in favour of. Pension issues rank high on the political agenda, as the Democratic Party of Pensioners (DeSUS) is part of the four-party government coalition. Slovenia will be severely hit by demographic development. Its dependency ratio will worsen from 21.7% today to 55.6% in 2050. Pension expenses will increase considerably. While Slovenia's current pension expenses amount to 11.0% of GDP, they are projected to increase to 18.3% by 2050. The EU-27 average is currently at 10.6% and is expected to increase to 12.8% by 2050. Assets in the voluntary occupational pillar stood at EUR 813 million in 2006, while those in the voluntary private pillar amounted to EUR 45 million. We expect that annual growth rates until 2015 will be between 19% and 25% for the former and between 22% and 27% for the latter. The mandatory earnings-related PAYG scheme covers employees and the self-employed. The public pension scheme was reformed considerably in 2000. The reform introduced the principle that each full year in the public scheme accounts for a pension accrual of 1.5% per year. Before the reform, it accounted for 2% and differed for women, who were granted higher accrual rights. Age limits were also gradually increased. They currently stand at 62 years for men and 55 years and 8 months for women. The target retirement age will be 63 for men by 2009 and 61 for women by 2023. The age limits increase by four months each year for women and by six months for men. The pensionable age can be lowered due to parenthood or a working life of 40 years for men and 38 years for women. A full pension is payable after 20 years of covered employment. The minimum length of service is 15 years. Moreover, the pension base was extended from the average of the best 10 consecutive years' earnings to the average of the best 18 consecutive years. The maximum pension was also reduced and capped at four times the minimum pension. Pensions were (re-)indexed to nominal wage growth in 2006; the 2000 reform had established that pensions lag behind wage growth. The contribution rate for the public pension system is now 24.35% of gross wages. Employees pay 15.5%, employers contribute 8.85% and the self-employed must cover the total amount. There are additional state allowances to the system. In 2002, 31.6% of total pension expenditure was taken over by the state in order to meet deficits and finance benefits for certain groups. Supplementary occupational pensions were introduced in 1992 and tax relief was expanded in 2000. Employers and employees may contribute to the schemes. Setting up occupational plans is mandatory in the public service and banking sectors as well as for particularly hazardous occupations. In all other sectors, employers can set up occupational schemes on a voluntary basis if at least two-thirds of employees agree to join. Pension plans, which are DC schemes, can be offered by insurance companies, mutual pension funds that are owned by their members, or joint stock pension companies. For large firms, pension companies are the preferred way to provide pension benefits. Funds may either be closed (sponsored by one employer with at least 1,000 employees) or open. At present, there is only one closed fund for public sector workers. Foreign investment in OECD countries is unrestricted in principle. However, due to the regulation stipulating that 80% of assets must be denominated in the same currency as liabilities, there is an effective limit to non-euro investments of 20%. Pension funds are subject to a minimum rate of return, which stipulates that the performance of pension funds may not be less than 40% of the average annual interest rate on government bonds with maturity dates of more than one year. If they do not meet this target, they must be offset. The enrolment fee is a maximum of 6% of contributions made. The withdrawal fee amounts to a maximum of 1% of the purchase value of units deposited into the personal account. The annual commission for pension fund management amounts to a maximum of 1.5% of the average net annual asset value. There are no limitations on switching providers, which is subject to fees. Pension plan members must be provided with annual information on the status of their individual accounts. Recent legislative changes stipulate that pension funds must provide members with a statement of their investment principles and the anticipated level of retirement benefits. Benefits are paid out as life annuities. Early withdrawals entail tax penalties. Assets under management in the voluntary occupational pension pillar total EUR 813 million and membership stands at 427,000. Employees who are not covered are usually from small and/or non-unionised companies. In early 2007, there were five mutual pension funds, four pension companies and two insurance companies on the market. All mandatory pensions for certain industries are managed by a mutual fund run by a state-owned financial institution. All employer-sponsored members are enrolled in open pension funds; closed company pension funds do not exist. In contrast to pension companies, mutual pension funds are not allowed to provide annuities. According to survey research, employers contribute approximately 3%, ranging between EUR 33 and EUR 44. In terms of market share, which is measured based on the number of members and also includes the private pillar, mutual pension funds have a share of 49%, pension companies have 42% and insurance companies 9%. Asset allocation is quite conservative. According to the latest available data from 2005, 44% of assets were invested in government securities, 34% in other debt securities, 14% in bank deposits, 4% in equities and 3% in mutual funds. Voluntary occupational plans are taxed according to the EET principle: Employers and employees have joint tax relief up to a maximum of EUR 2,390. Up to this limit, contributions are tax-exempt, as are investment earnings. Pensions in payment are subject to ordinary income tax rules. 427,000 participants, or almost 50% of employed people, are enrolled in the voluntary occupational system. The growth in membership was 6% in 2005, which was lower than the previous year when public sector employees entered the system. Assets in the voluntary occupational system amounted to EUR 813 million in 2006. In the coming years, further development will result mainly from wage increases. In the minimum scenario, assets under management are expected to reach EUR 4.0 billion until 2015 based on the conservative assumption of 5% average performance. In this scenario, volumes will increase by 19% per annum until 2015. In the optimistic scenario, the volume would grow to EUR 6.0 billion (+25 %). This scenario is realistic if households consume less and the government encourages people to save more for old age provision to compensate for falling pension benefit levels. 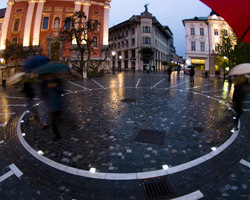 The lack of a mandatory second pillar makes Slovenia an exception among other countries in the region. The Slovenian government limited itself to parametric reforms that focused on securing state provision of old-age income. Slovenia's system resembles Continental European pension systems with a generous and redistributive first pillar that is financed by social contributions. However, reforms can be expected to continue as Slovenia experiences one of the biggest demographic shifts in Europe. Despite some foreseeable challenges, Slovenia's second occupational pillar has achieved high coverage and life insurance penetration is the highest in the region. In this sense there are significant funded elements in Slovenia's pension system that contribute to diversifying retirement income. Even if the country's market is small, Slovenia is the wealthiest CEE state and therefore attractive for asset managers.